Adventures Unlimited Press, has taken another bite from the Kennedy assassination apple. Their first effort was the stupefying Liquid Conspiracy: LSD, JFK, the CIA, Area 51 and UFOs (Mind Control and Conspiracy Series) by George Piccard; their second was the awful LBJ and the Conspiracy to Kill Kennedy by Joseph Farrell. Their third attempt JFK: The French Connection, while mildly better than both, still joins this company’s poor roster in regards to the Kennedy assassination. Peter Kross had some name value in the JFK zone, at least until this book turned up. Indeed the illustrious Bill Davy (whom I utilize in this piece later on), got his first break in the JFK world by writing for Kross’s magazine Back Channels, and Kross quotes him on page 259. Mr Kross has been busy of late, he has re-released Oswald, the CIA and the Warren Commission: Unanswered Questions, a study based on the newly released files via the JFK Record Act, which he self-published in 1997. 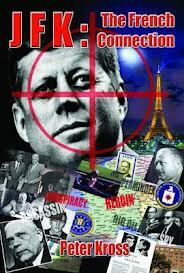 This book was re-published late last year (Oswald, The CIA and The Warren Commission). It has the meritorious distinction of being one of the first volumes to mention the CIA’s John Scelso (real name John Moss Whitten) and his investigation into Lee Harvey Oswald (something I shall return to later). Usually, when I critique a book I like to provide a synopsis of the book and a plan. But that is hard to do with this rather confounding volume. Therefore, I am a bit concerned this essay could be one of the least focused reviews I have ever done. His book, rather than discussing and elucidating a possible French connection to the case, has needlessly confused the topic. On page 2, Kross states his research has three areas of study. They are Steve Rivele and his travels around Europe trying to find the “The Men Who Killed Kennedy” , and this appears to be the first. But yet if this is truly the beginning point, why does Rivele’s mission appear 163 pages later, in what should be his second part? Kross writes that part two is an investigation into the identity of the two infamous CIA operatives, QJ/WIN and WI/ROGUE in the Congo. Rivele was at one point researching who these individuals were. Hence, it should come as no surprise when Kross discusses the connection between the OSS, CIA and heroin smugglers as his third theme. Because his hero, Steve Rivele, also had plenty to say on the topic. Yet for all Kross’s pretensions, the book never follows the order he outlined in his introduction. And Rivele’s musings about US intelligence and drug running is in his final phase. Most of his part three actually appears at the start of the book. For anyone to make up their ‘own mind’ as to the validity of a ‘French connection’, they need to be presented with the evidence in a clear and concise manner. They also do not need to have Rivele’s flawed argument—which in most quarters was discredited—defining any potential ‘French’ involvement. In fact, for Kross to rely so much on Rivele is reminiscent of Farrell’s use of Craig Zirbel’s unimpressive The Texas Connection as his central thesis. Kross, like Farrell, is not presenting any ‘take it or leave it’ debate. If one is pushing someone as unreliable as Rivele—while adding no further field investigation of one’s own—that is pushing an agenda. As I mentioned in my review, Guy Banister was the victim of numerous trivialities in Farrell’s book. True to form, Kross’s book also drifts into fantasy concerning the man. In exploring these allegations, I called upon one time Kross associate William Davy, author of the fine Let Justice Be Done, who alongside CTKA’s Jim DiEugenio, is widely considered one of the foremost authorities on Banister in the research community today. There is no real evidence that Banister, a career FBI man, was ever in the ONI, though there is no doubt he had close contacts within its ranks. During his wartime FBI work, his contacts with the ONI would have been frequent. It should also be noted his lawyer, Guy Johnson, was a former ONI agent. All that happened is that Delphine Roberts ID'd a photo of Nagy as someone she thought she saw in the office. I think Jonathan Blackmer showed it to her. I didn't use it since there was no other back up for it. To my knowledge, no one else saw him. And why would Nagy be at Banister's anyway? Especially when Maurice Gatlin was the go between for Permindex already. According to Davy and DiEugenio, Banister was never in Spain either. And I didn’t need their expertise to point out that Banister was not the head of the Chicago FBI at the time of Lumumba’s death. Banister retired from the FBI in 1954, Lumumba died in 1961. This information is ‘JFK 101’ stuff, which is ironic. Kross peppers his book with ‘JFK 101’ speeches, in which he reminds the reader of some basic facts of the case. Dare I say, I would advise any ‘101’ student interested in JFK to skip the lectures. To give Kross his due, there is some interesting—if standard—information in his opening three chapters, which concentrate on the United States association with mobsters, narcotics and the creation of the CIA. But yet, its not current in relation to the new discoveries in that field. For instance, not once does Kross mention that the post-war fun and games in Marseille between competing gangsters, fascists and intelligence agents came under the Operation Gladio umbrella. Jan Klimkowski of the Deep Politics Forum has frequently noted this as a critical error of modern day authors investigating the post war European drugs scene. I concur that any researcher worthy of the title should be up to speed on the new revelations about Gladio if one is going to deal with this subject area. Thus Chapter 3: “The CIA GoesWorldwide & the Beginning of the Heroin Connection" is very dated by todays research standards. How can one take seriously any author who instead, of referencing Gladio, settles for unreferenced myths about the FBI’s Division 5, straight from the bowels of the Torbitt document (pgs. 14-15). That’s like reducing Gordon Ramsay to tossing burgers at Wendy’s. Also, Kross errors in naming the CIA officer who was running the JM/WAVE station in Miami. It was not William Harvey but Ted Shackley. He also floats a rather odd idea, namely that Florida mobster Santo Trafficante worked as a double agent for Fidel Castro. (pgs. 43, 51) There is no real explanation here as to why or how Trafficante would do such a thing. After all, Castro was closing down the Mafia owned casinos, and was also anti-drugs. I am not categorically saying this tenet is false, but that Kross does not supply enough evidence as too why it is true or how the arrangement worked or the motive for either man to operate like that. From Chapter 4 onwards we dabble into US involvement in the Congo. Kross discusses the possible identity of QJ/WIN (an infamous CIA operative in the Congo at the time of Lumumba’s death). This is important for Kross as he can slowly unleash Rivele’s influence into the book. However, before we discuss his use of Rivele, I would like to point out one thing that I had begun to notice earlier that was a bit disturbing: Kross acts speculatively and sensibly in one sentence with certain information, but he then makes a profound definitive statement with that same information seemingly a sentence later. On page 91, he states the guessing game is ‘all we have’ as to the identity of QJ/WIN. Then soon after states, “He may have been on the famous grassy knoll”. He goes on “And may be the figuredubbed badge man, due to the distinctive type markings on his jacket”.This is a very big statement. Opinion remains divided as to the existence of any ‘badge man’ figure at all in the Moorman photo. Indeed, in the proceeding chapters, Kross also makes numerous claims that QJ/WIN was a top assassin. The problem is that he repeats himself some eight times that the documentation concerning QJ/WIN touted him as a talent spotter, planner and apparent ‘Mr Fix it’ in Chapter 4. The eight repetitions are an impressive feat when the chapter is barely twenty pages in length. Now to the role and identity of QJ/WIN. Before Richard Mahoney told Rivele he was barking up the wrong tree (page 167) Rivele, upon a discussion with Gary Shaw, had believed that Christian David and Lucian Sarti were the notorious QJ/WIN and WI/ROGUE. Shaw, like Rivele, later disowned this claim. Yet, Kross for some reason known only to himself, recycles it. Poor use of repetition and ignoring sources aside, Rivele and his disciple Kross never bothered to consider the real qualities required of CIA field agents, not to mention their underlings. While stumping for David and Sarti as top level, high class, assassins (more about that later). Without any sense of irony, he then included information that actually contradicted their credentials. 1) Christian David was branded part of a ‘Wild and undisciplined’ Corsican group (page, 154). 2) Sarti, for his part, was described as ‘impulsive’ and frequently got colleagues into trouble with his rashness and was unpopular with them (page 174-75). 31 Memorandum for the File: Alleged Agency Involvement in the Death of Patrice Lumumba, 10 March 1975, pp.1–2, Box 6, F2, Records of the Central Intelligence Agency – Miscellaneous Files, NA; and Belgian Parliamentary Inquiry, p.130 identifies QJWIN as Moise Maschkivitzan, a Belgian-born convicted swindler who was expelled from Belgium in 1953. Assassination Plots, p.43. Masckivitzan, an important and mysterious individual, never gets a mention in the Kross book. Indeed an excellent journal article by Edouard Bustin concerning the murder of Lumumba (which Kross ‘the QJ/WIN expert’ should have read), can be seen here . It surpasses much of the research in this book. On a final note, some pages toward the end of this section, Kross deals with the Watergate Plumbers and Robert Vesco. While interesting and linked to one another, neither topic really has anything to do with the Congo, Lumumba, ZR/Rifle, QJ/WIN and WI/Rogue at all. This is essentially 37 pages worth of a tangent, which dilutes further his rather sad and disorganised and ultimately redundant attempt at listing other possible candidates for WIN and ROGUE. Kross briefly utilises Gaeton Fonzi’s classic The Last Investigation on page 235. Oddly, he only uses Fonzi to quote Cyril Wecht’s comments about bullet trajectory. Fonzi was widely regarded as one of the best ever researchers ever on the JFK beat. His understanding of the anti-Castro Cuban angle in the JFK case was widely celebrated. While he did not delve into the so-called French Connection aspect of the case, his investigations for the HSCA took him on many journeys. Rivele, who began his independent mission some six or so years after Fonzi, beat a different path in search of French gangsters, not rightwing Cuban connections. He would have been wise to have looked up Fonzi and gotten advice. Fonzi grew to distrust all but a small few of the so called ‘intelligence sources’, he was referred to by ‘insiders’ he encountered. Rivele, on the other hand, embraced his connections with intelligence operatives and failed miserably to realize the wild goose chase they sent him on. A case in point is Lucien Conien who, rumour has it, apparently tipped Rivele off about Christian David and his Corsican connections. This is an interesting accusation. But Kross says it was J Gary Shaw, who put Rivele on to David (Kross, p, 315). The late Jack White, who was close to Shaw, stated that Shaw had told him it was actually Conien , who had put Rivele onto David. (We will update this point with more confirmation). First, let us review Rivele’s original story as presented back in 1988 in the original series, The Men Who Killed Kennedy. Rivele interviewed criminal Christian David in two different prisons, one in America and one in France, after he had been deported there against his will. David told him that there had been three assassins and they were hired by a man named Antoine Guerini, a leader in the Corsican mob in Marseilles. Rivele worked on this lead and claimed that he eventually discovered the names of the three button men. He then proclaimed, without any evidence, that the contract was given out by Trafficante, Marcello and Giancana. Rivele was willing to suspend belief even in the face of David’s criminal record. The man had been charged for heroin smuggling and murder. To top it off, Rivele added on camera that “I don’t think the CIA…had anything to do with the assassination.” According to Rivele, and this should have been a dead giveaway, David actually claimed to know the trajectories of each bullet fired in the fusillade. Even though, according to David, he was not even there. How could any assassin know that kind of information especially, considering the incredibly bungled autopsy of President Kennedy? Further, David said there were only four shots. Which seems bizarre with what we know today, yet Rivele had traveled much too far to be disturbed by any such apparent problems. He finally concluded that the assassins were Lucien Sarti, Sauveur Pironti and Roger Bocognani. One of the few highlights in Bradley O’Leary and L.E Seymour’s painfully contrived book, Triangle Of Death: The Shocking Truth About the Role of South Vietnam and the French Mafia in the Assassination of JFK. Is that though they have a similar cheap ‘mob’ angle to Rivele, they point out in Chapter 18 that David was desperate to stay in the United States and not be deported back to France. Thus, he spun Rivele something of a tale concerning the assassination. They also point out, had David’s famed letter to his lawyer contained worthwhile information, he would have used it as a plea bargain. If you are naïve enough to believe the US Justice System could cope with prosecuting the Kennedy assassination, this could be a valid point. Nevertheless, the reality is that the system would not cope with that issue and it is therefore a null one. In the real world, if the letter had anything of merit, David and his lawyers would likely have been swimming with the fishes some time ago. Rivele himself was forced to retract his claims. It really says something about the quality of his work that he never checked on any possible alibis for his alleged assassins (yes criminals of even the most petty variety have them). It also speaks volumes about the work of Nigel Turner the series producer. Yet, this huge imbroglio did not really hurt either man. Eric Hamburg, who now reportedly backs Saint John Hunt’s latest enterprise, liked Rivele’s ridiculous claims and this led Hamburg to recruit Rivele to write the film he co-produced for Oliver Stone, called Nixon. Turner went on to make even more segments of The Men Who Killed Kennedy. He featured such dubious personages as Tom Wilson and Judy Baker. He then had Barr McClellan on for the 40th anniversary. Somehow forgetting (as he should) Rivele’s earlier claims about Trafficante and Marcello and Giancana, Turner now had McClellan say on camera, and in close up, that it was Lyndon Johnson who killed Kennedy. Regardless of McClellan’s snake oil, as stated earlier, there was always the question of David's unsuitability to 'formal' operations not to mention both he and Sarti’s volatile personalities. Those individuals coordinating and communicating in and around Dealey Plaza would probably know their men and would definitely not want any unstable ‘hotheads’. Which is rather interesting because if perchance Rivele’s suspects and their day jobs were indeed 'alibis' they were still the exact opposite of requirements. Sarti we know had a hair trigger temper and as of two paragraphs ago bad eyesight, would he truly be capable of performing the job? Some folk, like Kross, want you to think so. Add to that there is no real evidence Sarti had trained or co-trained the others as snipers with David (yes David folks in Chapters 1-6 it is clear in my mind the he is also a suspect of Kross’s in the JFK assassination). If perchance they did, their utterly chaotic lifestyles meant that it was highly doubtful they spent the requisite time practicing and honing their craft, an essential part of any professional marksman’s routine. Especially when it is likely there was a coordinated volley of shots, including diversionary ones to confuse witnesses and muddy the evidentiary waters in Dealey Plaza that day . In this type of military style ambush, with extremely high stakes, I would not trust these individuals to fiddle with brakes in my neighbor’s car, let alone perform a pinpoint execution of a head of state travelling in one. Anybody serious about what a high-level assassination involving rifles and coordinated military style ‘triangulated crossfires’ entails should read ex-sniper Lt. Colonel Craig Roberts One Shot One Kill (written with Charles W. Sasser) and at least the first half of his book Kill Zone: A Sniper Looks at Dealey Plaza. Roberts has wandered off into the wilderness with some of his latest conspiracy musings and is now a staple of Alex Jones. Nonetheless, these one and a half books are solid and give a unique insight into the mind, skill set and disciplines required to be a presidential level hunter. So without further ado, let us look at how Kross briefly deals with the aforementioned John Whitten. He chooses to do so in Chapter 7: “Who was Souetre?”It is unfathomable to me why he makes the reader wait some 233 pages before discussing Jean Souetre and his back story, not to mention his alleged impersonation by Michael Mertz (the next chapter) which, unlike Rivele’s unfounded Christian David inspired fantasies, are still of some interest in JFK circles. Indeed, a discussion of Souetre/Mertz and another well known figure tied to them, Michel Roux, should have taken place in the first chapters of the book. Now, Kross does use the research of individuals who have followed these figures, like Bud Fensterwald, Mary Ferrell, J Gary Shaw, Henry Hurt and Doug Valentine. But what should have been done was to examine that alongside the works of De Witt and Mahoney (debunking the Corsicans in the Congo angle), and the mess of Rivele/Turner. And this should have led to a carefully organised examination of the facts concerning a possible French Connection. It is a complex matter, requiring careful, concise writing and editing. Kross, as we have already seen (and will see again shortly) seems incapable of the task before him. Was Souetre/Mertz/Roux a potential assassin in the US or on other business? Could, he/they have merely been used as something of a decoy for the real instigators, in the same manner that say Joseph Milteer, or Jim Braden may well have been? Sadly, you will never really know from this book. It seems as if Kross simply threw everything and anything into his French gumbo, including grossly misappropriating John Whitten’s investigation (taking the shine off his previous good work in being one of the first to name Whitten all those years ago). Hence below is but one example of the confusion that reigns within JFK: The French Connection from snippets between pages 245-247. 2) Kross also discusses Helms cutting Whitten off at the knees for dabbling into the Oswald rabbit hole. Which, while true, leads to his making a confusing leap. For Angleton was the individual who took over the investigation from Whitten. Roman, as stated worked for Angleton and never, ever worked for Whitten. 3) However, Kross never bothered to tell the reader about Helms passing on the investigation to Mr Angleton. Instead, he then discusses Angleton’s being in charge of Oswald’s files (as if the two were separate issues) and utilizes John Newman and Jefferson Morley’s interview with Roman to do this. 4) He then buys into the line Roman pushed. That being that the CIA did not know who Oswald was, or if he was a Soviet agent when he arrived back in the United States. This is simply not supportable today. Had Kross read and noted any one of Newman, Hancock, Melanson, McKnight, Douglass, Evica, Di Eugenio, Prouty, Pease and Davy’s works--and this is just the beginning--he would understand the Agency, especaily Jim Angleton, was all over Oswald before he went to Russia and way before he arrived home again. 5) Kross, in a cool manner, mentions an FBI memo sent on the 9 th of March 1964, asking for information from the Agency concerning French agent Jean Souetre (the French Connection) and his visit to the United States. (p. 246) He then describes in this memo how Roman had simply sent a memo on June the 12 th 1963, describing Souetre’s attempts to enlist US support in aiding the overthrow of De Gaulle. 6) At page 247 however, Kross is a man transformed. Using the above FBI memo, in a remarkably Hankeyian fashion, he now rabidly describes the agencies interest in the French connection at the time of the CIA’s own investigation into Oswald. As if ignoring his own evidence wasn’t silly enough, after being one of the first researchers to publish the information about Whitten he should have known that his investigation (regarded as the CIA’s only real one), lasted under three weeks from the time of the assassination (Gerald McKnight, Breach of Trust: How the Warren Commission Failed the Nation And Why, pgs. 347-348). Therefore, in March of 1964, the man running the CIA’s inquiry into both Oswald and the JFK case was Angleton. What rankles this writer is the penchant for some in the Kennedy assassination research community to disregard all those who disregard their own conclusions, i.e., the Mafia killed Kennedy. All writers bring some knowledge to the table on the assassination and their viewpoints should not be pushed aside for one’s own petty grievances. What ‘rankles’ this researcher is that Kross failed to screen good research from bad e.g. Steve Rivele’s. That’s where grievances come from, and it’s not petty. And its not simply a matter of personal biases. It is a matter of doing a comparative analysis of the overall evidence. It is a matter of quality control. The work of Waldron and Hartmann has been shown to be anything but exhaustive. One will search far and wide to come upon books more agenda driven than theirs. The high profiles enjoyed by Kross’s ‘mob did it’ disinformation brigade, have set JFK research back many years. Somehow, Kross cannot see that very serious problem. Which helps reduce the stature of this book. Not all things are equal in the Kennedy research zone and good, honest researchers are in the minority and at a premium. This is why, in praising JFK and the Unspeakable: Why He Died and Why It Matters , Jim DiEugenio called it the best book since Breach of Trust . The good efforts are that few and far between. And Waldron and Hartmann are not even close. The points I noted previously in Chapter 7, concerning the snippets on pages 245-247 equate to approximately a full page. So all said, if one could cull all of Kross's often un-sourced, repetitive, inaccurate and unnecessary ‘snippets’ from his 380 leaf book he would lose at least a quarter (near enough a hundred or so pages) and that’s not all. If we include the thirty or so pages discussing Watergate and Vesco, the 28 pages of Waldron worship in Chapter 8, and another thirty or so pages, which are effectively a synopsis of Rivele’s starring role in The Men Who Killed Kennedy in Chapters 9-10, his book is only worth about 180 pages. And much of that number is stock standard musings done many times before, by better writers. I wanted this review to be capped at five pages it is now around eight. I could easily have gone on for much longer. For it is a disjointed, unorganized, poorly referenced, repetitive ramble. Shame once again on the publishers for exhibiting their woeful understanding of the JFK arena. With nearly two million pages of declassified documents, the JFK case should be an interesting topic. This book competes with Harrison Livingstone’s The Radical Right and the Murder of John F. Kennedy: Stunning Evidence in the Assassination of the President and Joe Farrell’s oft criticized tome for flat out over reliance on unworthy theories, not to mention narrative incoherence. In the past Kross appears to have been capable of some okay stuff. Why he decided to offer us another discredited/rehashed theory—in the worse sense of that term—in this day and age is unexplainable. As Jim DiEugenio has noted on Len Osanic’s Black Op Radio, with the work of the ARRB, the last thing we need today is another theory. What we need today are facts and evidence, forty-nine years later, the days of theorizing should be over. The saddest thing about all of this is that Kross has done some passable work in years past, and one feels he is capable of doing so again. Had he taken more time with this maybe he could have come up with something more tangible, as it stands however this book feels rushed and slapped together and is simply not up to the standards required of such an endeavor.